Tiels love to whistle, or at least the males do. Males are very cute when they're whistling and showing off. They aren't great talkers though and anything they do say will be more of a whistled version. 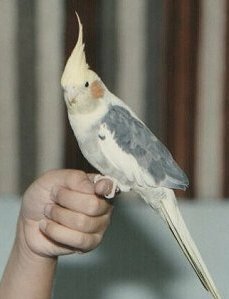 My male tiel Tootsie used to say "pretty bird" and another bird I knew named Jake could say "Jaker Bakers." Tootsie actually picked this phrase up from him but would only say it once in a blue moon. They can easily make it to 20 or 30 with good care. Tiels are dimorphic which makes sexing easy. Normal colored males have a yellow head. Hens look just like chicks- they are grey and retain the yellow bars on their wings and tail. Mutations often cannot be sexed visually but can easily be distinguished by behavior. Male cockatiels will sing and show off when presented with a mirror. Hens usually won't show any interest in it at all. More help sexing various mutations, see Sexing Cockatiels Visually. Night Frights- Occasionally an owner will be woken up by the sound of their pet frantically thrashing about the cage. Odd noises, movement or lights may set off such a fright (like if you try to sneak past the bird's cage at night without turning on the lights). Some frights have no apparent cause. Frights can be dangerous because the bird flaps about, refusing to calm down. Thrashing birds can easily break a wing, leg or bloodfeather. Use flour to clot the blood if a feather is bleeding. If your tiel is prone to frights there are several things you can do. First, try to find out the cause and eliminate it. Is the bird next to a window? Could passing car headlights be the cause? Try covering the cage or leaving it uncovered. Try placing a night light in the room. If nothing seems to help, it would be beneficial to have a separate cage for the bird to sleep in, one without lots of toys and perches for it to knock into. One thing you should consider for your own health before buying a cockatiel is that they are very powdery birds. I wouldn't recommend them to anyone who has asthma or any other serious respiratory condition. If you still want a tiel but have allergies/asthma, invest in a good air filter. Cockatiels aren't as active as kaks or budgies so they don't require as much room. Still, the cage should always be as large as possible. Pets will require a lot of time out with their owners. Pairs will breed in modest-sized cages. 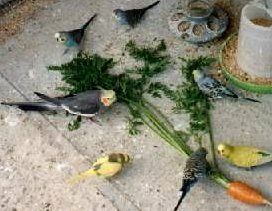 Regular psittacine diet. Mine refuse fruit but love all kinds of veggies. Frozen veggies and leafy greens are favorites. The cockatiel personality can be summed up in one word: sweet. The cool thing about cockatiels is you get a bird with all the good qualities of a cockatoo or larger parrot without all the vices. Cockatiels are very cuddly, but don't get so attached to their owner that they develop bad habits like cockatoos. A tiel's favorite place to be is on its owner's shoulder. Like most birds, they love spending time with the family and will call out if separated. Tiels have a very specific call for "Where did you go? Come back!" and will use it when you walk out of the room. Some owners find this call very irritable, and there are a few things you can do to prevent the bird from calling incessantly. First, keep the bird's main cage in the living room or other actively-visited room. Second, keep the cage well-stocked with toys so that the bird has something to do when you leave. Third, put the bird on a schedule. Like most of us, birds like knowing what to expect. If you come home every day at around the same time, let the bird out, then put it away while you make dinner, the bird will learn that there are certain times it will be out and certain times it will be caged while people are still around. Lastly, don't reward constant calling by walking back into the room, yelling at the bird or otherwise acknowledging the behavior. Doing so only teaches the bird that calling will get it what it wants- your undivided attention. You want to encourage an independent bird, not a clingy one. Aside from calling and the typical attitude that comes with puberty, cockatiels don't have many behavior problems.